In 1776 the United States government started out on a shoestring and quickly went bankrupt fighting its War of Independence against Britain. At the war’s end, the national government owed tremendous sums to foreign creditors and its own citizens. But lacking the power to tax, it had no means to repay them. The Founders and Finance is the first book to tell the story of how foreign-born financial specialists—immigrants—solved the fiscal crisis and set the United States on a path to long-term economic success. 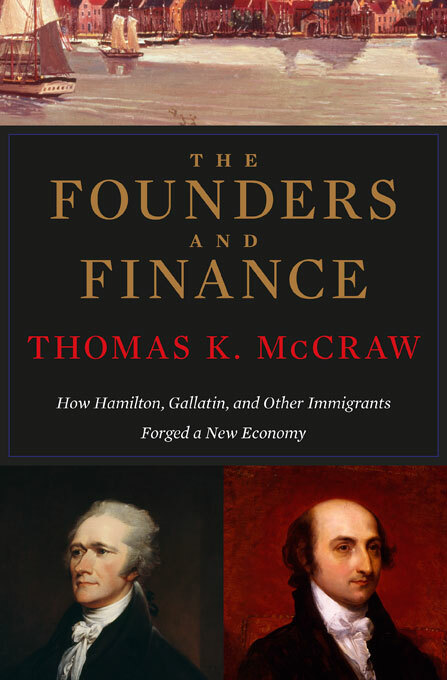 Pulitzer Prize–winning author Thomas K. McCraw analyzes the skills and worldliness of Alexander Hamilton (from the Danish Virgin Islands), Albert Gallatin (from the Republic of Geneva), and other immigrant founders who guided the nation to prosperity. Their expertise with liquid capital far exceeded that of native-born plantation owners Washington, Jefferson, and Madison, who well understood the management of land and slaves but had only a vague knowledge of financial instruments—currencies, stocks, and bonds. The very rootlessness of America’s immigrant leaders gave them a better understanding of money, credit, and banks, and the way each could be made to serve the public good. The remarkable financial innovations designed by Hamilton, Gallatin, and other immigrants enabled the United States to control its debts, to pay for the Louisiana Purchase of 1803, and—barely—to fight the War of 1812, which preserved the nation’s hard-won independence from Britain.